I’ve even left it like that even after they implemented the ability to move characters around, most likely because I am lazy. And I’ve had few complaints about my character creation order either. 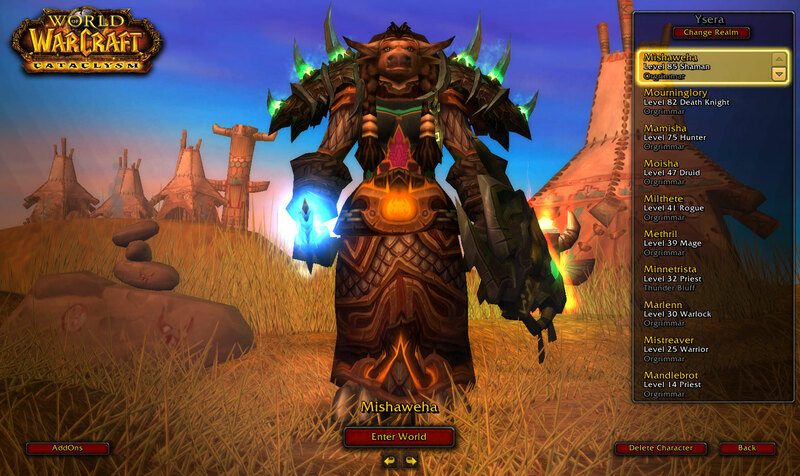 It used to go in a pattern for races: Tauren, Undead, Tauren, Blood Elf, repeat. 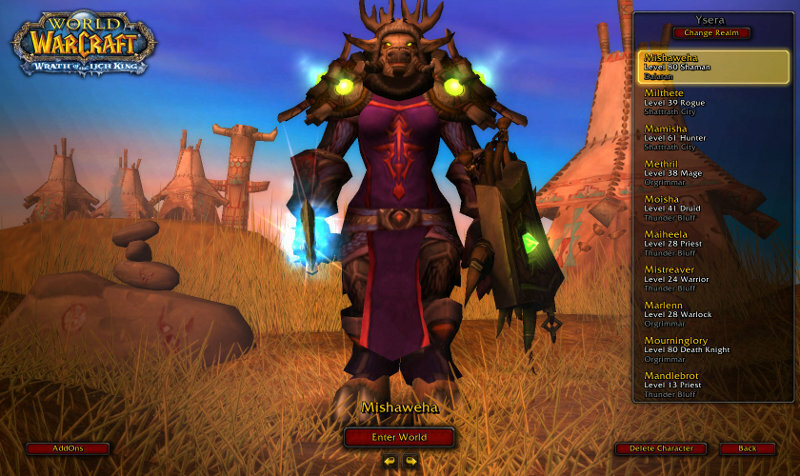 Though now that order has been broken when I race changed my Undead Priest, Maiheela, into a Tauren named Minnetrista; not to mention my last toon, a token male Blood Elf, had already broken the pattern by not being undead. Since the pattern is broken (or just because), I’ve decided to shift their order. Back to a simpler time, when they used to be in order by level. And so I present to you… the new character selection page! Once again order triumphs over chaos. Let’s see how long it takes before my resolve breaks and I change it back. This year marks the first year since achievements came out that I have not completed the School of Hard Knocks achievement. The first year? I completed it with Mishaweha, thus allowing myself to secure this wonderful mount later in the year. The second year? 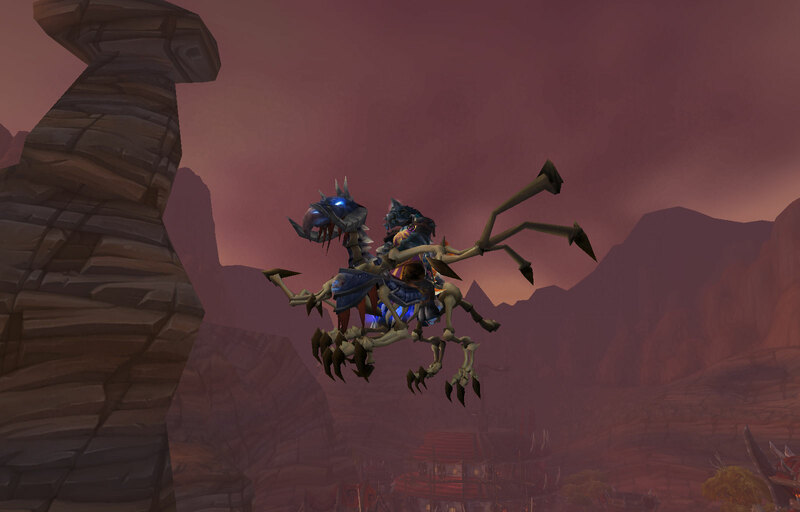 Mourninglory had her turn, giving her a similarly wonderful mount that I probably won’t use because Death Knights are practically required to fly on a bone gryphon because, come on, Death Knights. 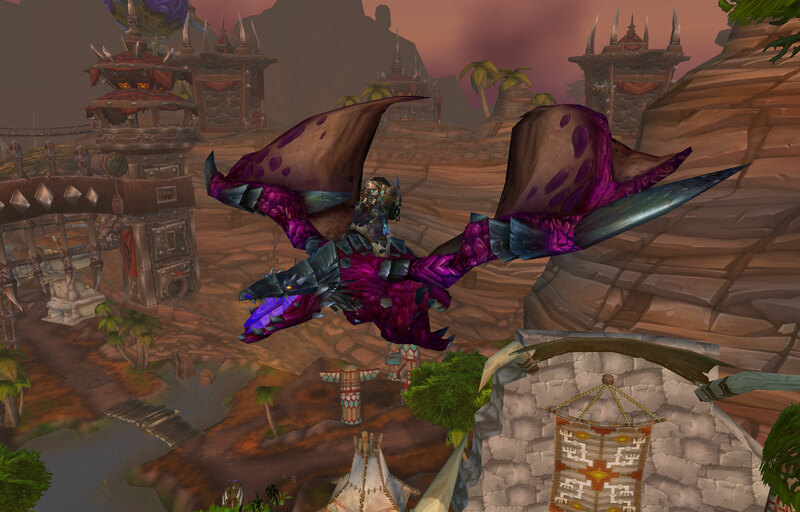 And this was the year that the next alt down the line — Mamisha, my hunter — would do as many of the Children’s Week achievements as possible, so someday she too could fly on a fuchsia-violet protodrake instead of her noisy roflcopter. Good question! Let’s analyze the possibilities. Was it because the achievement suddenly became too hard to do? Nah, that wasn’t it. Cynwise’s guide has always been helpful for these achievements. 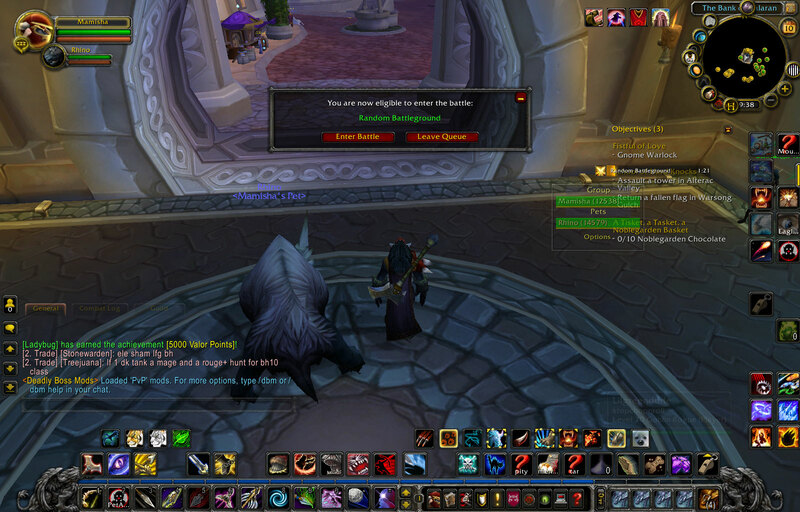 And even at the lower levels, where more people are trying to PvP and not do the achievements, it’s still possible. Though I must admit, the graveyard changes from WSG makes returning the flag a lot trickier when you can’t just run back up to defend. How about realizing the achievement was poorly designed and not doing it in protest? Fah! I’ve done it twice, I can keep on trucking. Though Rades had come up with some much better, team based solutions to the achievement that I believe would suit most everyone else much better. It’s a little too late to change it now, though, as those who have already done it might cry foul that they wasted their time. What about the fact that I got a cold during the week? Actually, that was partly a factor. I definitely took time off from WoW to sleep and recover, which took away potential time to run battlegrounds. It’s hard to patiently wait for battleground or make a beeline for an AV tower while your throat is sore, your nose is running, your head aches, and your new cat is trying to run all over your keyboard. That’s right, the battleground entry screen. Or in my case, the non-entry screen. Over half the time, when I would click on the ‘Enter Battle’ button, the box would merely disappear, leaving me out of luck. When I would check the battleground queue button, it would either tantalize me with the option to enter the battleground (but it was lying), or the queue I was in would simply not be present. With this happening fairly often, I soon lost patience with the system. 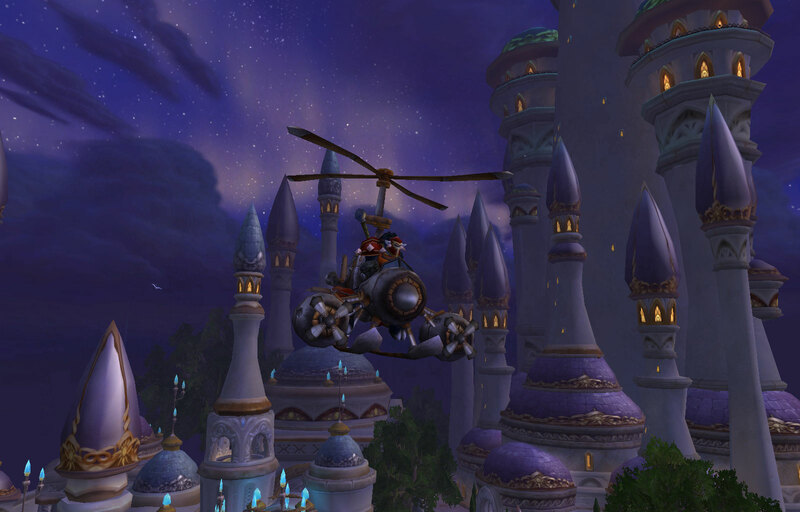 It’s one thing to wait for a battleground to attempt to complete a difficult achievement. It’s another to wait for a battleground you may not even get into to try for an achievement you may not get. In the end, I’m not sure if this was a widespread bug, or just caused by one of my addons messing up the system after the patch. My laziness cold prevented me from fully investigating. But when a basic system like the battleground queue fails, it makes completing frustrating achievements not worth it. Reusing last year’s card, eh? 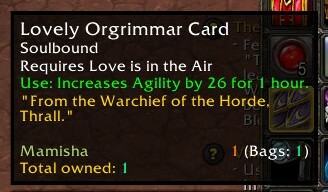 "Mamisha had to read the Lovely Orgrimmar card over again. It seemed that Garrosh's "thanks" was apt, as he gave away outdated cards..."